Assumptions: I assume you have looked at the tutorial on making the splines themselves. 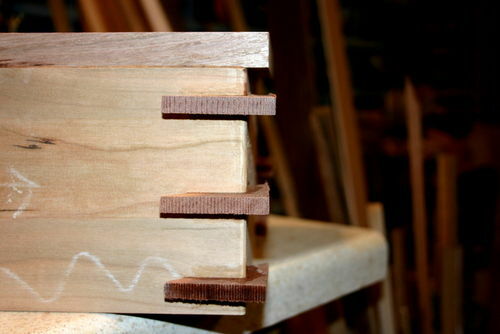 The tutorial on cutting the splines slots with the jig there gives you a box that looks like this on the corner. The next step is to glue the splines into the slots. I should have pictured it, but I apply Tightbond’s Carpenter’s and Trim Glue to both the spline and the slot to assure there will be a good bond. This thicker glue is easier to work with, and much less runny, but it should be stored upside down to be sure it flows out when you squeeze the bottle. Keeping your plumber’s brushes in water will let you reuse these brushed for months. Dry them on a paper towel before you apply glue. (below) This is a demonstration box that I use to explain to customers and students the steps involved in the spline process. All the spline slots are cut and the splines glued in place and smoothed down even with the sides of the box before the top of the box is separated and the hinge is added. (above) This represents adding the splines in the demo box. There is a tutorial about gluing on a lid onto the box. Let’s take a close look at the corners. As you can see the top and the splines are hanging over the sides. 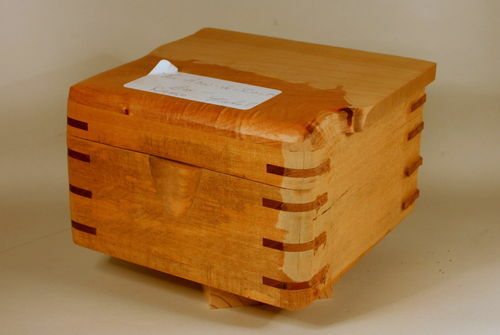 Now make to trip to the band saw and trim away most of that overhang without cutting into the side of the box. 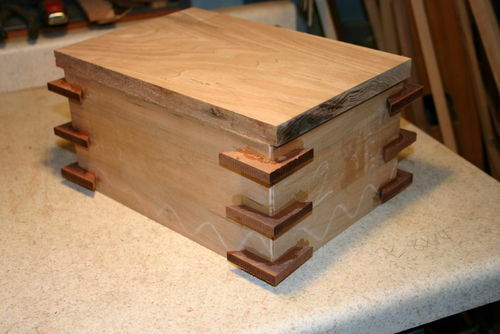 After bandsawing away the overhanging top and splines, It will look something like this on the corners. With the overhang removed you can now apply a large bearing-centered flush trim bit to remove the last of the overhanging top board. The alternative is to use rough grit sandpaper to remove the last of the spline overhang and top overhang and then make the sides of the box smooth and all surfaces flush. This will give you a box that looks something like this corner does. For rounding over the corners and the top of the box your bearing has to ride on the smooth sides of the box. There is a real possibility of kickback when you are using a large roundover bit on a router. Use a starter pin, and consider making a light pass first, then another pass. Grip the box tightly and be very wary of kickback! You may be more comfortable using a flush trim bit on the first step of this route to smooth away the overhanging top after you have used the band saw. 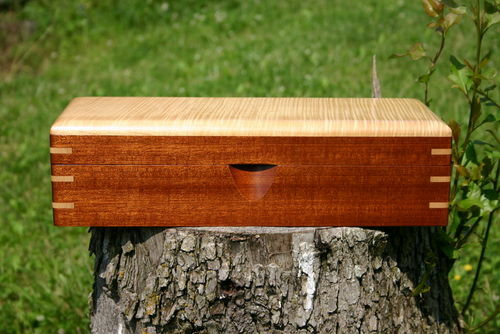 The flush trimming bit will remove the last of the top overhang on the side of the box or you can smooth away the last of the spline and top overhang with sanding using rough grits. 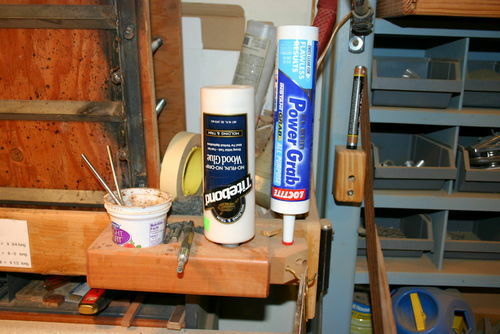 This is the time you want to remove all of the glue squeeze out from gluing your splines into the slots. Next the top is separated and hinges are added and the corners are sanded and finished. When all this is done you should have a box that looks something like this. To see other boxes click here. Making a tutorial with this many links and pictures is pretty exhausting. I hope it is of use to my fellow Lumber Jocks. I do know how complicated and time consuming writing this kind of blog is… you have done an excellent job. I particularly like your technique and your pictures. All the little hints are great as well (upside down glue bottle, your glue center) I cut my excess off the splines with a dozuko saw. This works well too. Ellen, I have used that saw for this job and you are right is does work very well. Guess I am just getting lazy in my old age. 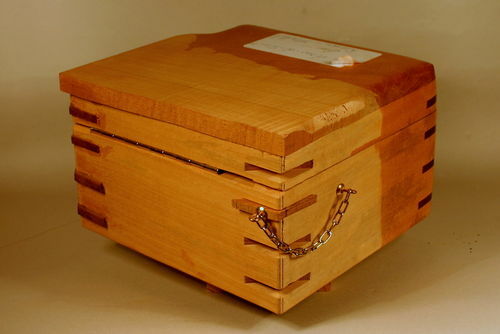 I agree with Ellen that you did a nice job and the finished box you illustrated shows you are the box master! I agree 100%, excellent job. Lorna, thanks. I hope these tutorials help some fellow LJs. Good luck with your summer sales. Topa, thanks and it is always good to hear from you. Great tutorial Al! I’ve just finished rereading all 10 entries and I’m sure I will refer to them often. I’m going to TRY to make some of those great jigs you’ve described. Great looking work! Thanks for sharing. Gonna give this a try. I learned a lot. It’s clearer than most books and I really appreciate all the effort you put into it. Thanks for the tutorials ! 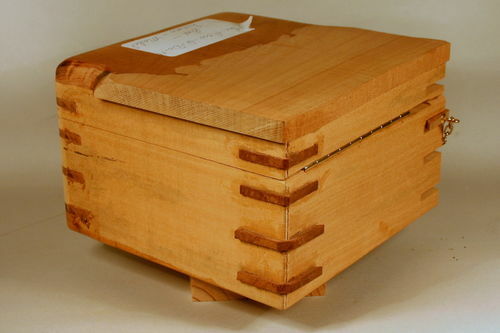 John, you are right about the attached lid boxes; there is a risk of cross grain splitting. Only time will tell. I have some that have gone about 10 years with no signs of a crack, but it could happen with a top glued on to the cross grain. Smaller size and air dried wood seems to help. It would not be a good idea with a larger box. 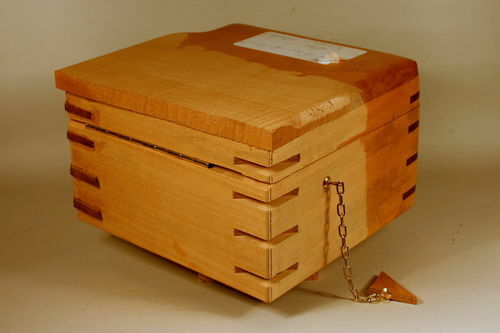 The inset tops that float would be a better bet for a box that you wanted to last for 100 years. I like the look so well that I can’t resist making them this way. When cutting the access away from my splines I take it to the bandsaw with a 3/16” 14 TPI blade I am able to do a complete row at one time, then finish the rest on the 4” belt sander. As for as wood movement, could it be that these boxes are small enough that movement isn’t as big an issue as a much larger project say for example a cabinet door? I think Blackie summed it up in the first line.